Autism: a spirit of confusion crossing the signals in the brain and in the mind coming from Jezebel and the deaf, dumb spirit, operating through the altar of Baal. It operates with a spirit of mind control and misdirects brain signals and neurotransmitters through the synpapses. The spirit of confusion causes the neurotransmitters to miss their intended target. I bind the strongman in their life. I bind every generational curse. I bind the spirit of Jezebel. I rebuke the spirit of confusion, manipulation and mind control. I bind every deaf, dumb, spirit and cast you out. I bind every generational curse and lay the axe to the root of every curse giving access to this demon of autism. I break every altar of Baal over their life and in their mind by the fire of God. I declare a coup d'etat against Jezebel and I overthrow all their works in their mind. I saturate and inundate the throne of their mind and their brain, their conscious, subconscious and unconscious with the blood of Jesus. I cast you out. The blood of Jesus on the mercy seat speak on their mind and to their mind: life and life more abundantly. The blood of Jesus on the mercy seat speak against every judgment of autism. The blood of Jesus on the mercy seat speak to their mind the wisdom of God and the ocunsel of God. I saturate and inundate and permeate their brain with the blood of Jesus and the glory of God. I declare and I decree that they have the mind of Christ. The blood of Jesus strip the curse of it's cause, it's effects and all it's side effects. I plead the blood of Jesus, against every judgment, eery accusation and every sentence against them, that they will be sentenced to a life of autism. I blot out the handwriting of every ordinance against them growing in wisdom and in stature in favor with God and with man, and I nail it to the cross. I blot out the handwriting of every ordinance against them in the second heaven, on the earth, underneath the earth, in the sea and underneath the sea by the blood of Jesus and nail it to the cross. I saturate, inundate and permeate their mind and their brain with with the balm of Gilead. I sever all lines of communication with the kingdom of darkness operating through their brain and their mind. I release a tsunami of Holy Ghost fire to burn and consume it. I declare and decree: salvation, healing and deliverance: over them, on them and in them; spirit, soul and body, past, present and future. I declare and decree that they serve the Lord with their mind. I curse the mark of the beast, the antichrist and the false prophet and forbid them to control, influence or operate through their brain, mind or any part of their life; access denied. Lord, they are fearfully and wonderfully made. Restore their brain and their mind to the original design and intent you ordained before the foundation of the world. I release your healing virtue to flow into every area, crack and crevice of their brain and mind. Thank you for optimal brain function and sharp keen and alert minds. 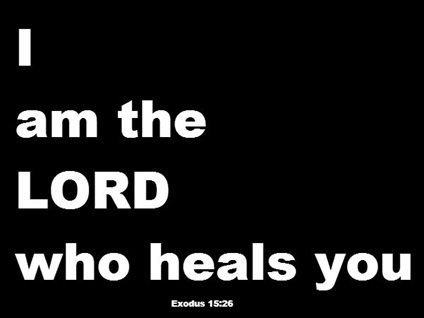 Thank you Jesus for being our healer! Who his own self bare our sins in his own body on the tree, that we, being dead to sin, should live unto righteousness: by whose stripes ye were healed.